Okay everyone, it looks like we have an unexpected challenge on our hands today. The dead have risen from their graves and are storming our building. They're pounding on the door of our collaboration space as we speak. We've lost contact with the other floors, which is a shame, as this situation really could have benefited from cross-department cooperation. So why am I smiling? Well, as your manager, I couldn't help but notice that productivity is a little low this month, and I think we can leverage this situation to strengthen our teamwork skills. Now, I know our past team-building activities could have gone better. I had no idea that one you suffers from claustrophobia when I held the escape room game in the janitor's closet. But defending this office from the horde of ravenous zombies in the hall is the perfect collaborative task. We're going to coalesce into a well-oiled machine. I'll be the oil in that metaphor, of course, and you'll be the machine. Not that I see you all as interchangeable parts. I respect each and every one of you and value your contributions immensely. I can see by the anxious looks on your faces that you're all eager to get in that hall and start crushing zombie skulls like our firm is crushing the marketing game. But given what happened to Mike, I think that for now our best path to capital-S Synergy is securing this room. So, time for some role clarification. Jeff and Donna, why don't you two barricade the door with that desk while Kelly and Rakim push those filing cabinets in front of the window. Chris, since you're our only gen-Z member, you can refresh Twitter every few seconds for news on the zombie outbreak. Haha, just kidding! A little joke to break the ice. Chris, you and your generation are amazing and are tomorrow's leaders, even if it'll just be in an underground bunker somewhere. Now, I know that working through this crisis goes a little outside team norms. We'll have to leave our personal comfort zones and do some experiential learning. But I like to think we have an environment where people are confident taking reasonable risks, whether it be a larger workload or bludgeoning flesh-eating ghouls with a fire extinguisher. Not that I expect it'll come to that, obviously. I have total faith in your ability to lock down this area. I've even got some snacks for when we're done. Though we might want to eat them sparingly. No telling how long we'll be in here. Did someone accidentally hit the light switch? Huh, I guess the power went out. On the plus side, the sirens stopped. I'm guessing the police have this under control and will be here any minute. Just to be safe, though, we'd also better barricade the janitor's closet. We don't want Mike getting out now that he's been bitten. I know he's scratching at the door and making angry moans, and I respect the emotional intelligence behind that approach, but as a zombie he'd be dysfunctional to our teamwork culture. 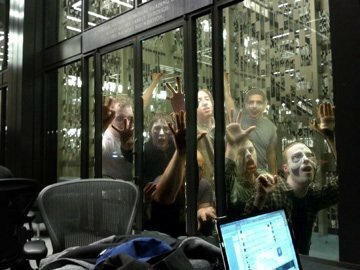 Oh crap, zombies are coming out of my office! I forgot it had a window. I guess I might have left it open, too... We still have a chance, though. If one of us sacrifices themselves to the zombies, the rest of us can probably escape. I know it's a horrible, gruesome death, but let's bracket our personal concerns for the moment and think of the team. Remember, none of us is as good as all of us. So who wants to step up to the plate? Hey, why are you all grabbing me by the shoulders? We had our daily huddle already. You Call THIS an Intervention? The Nunes Memo: "It is OK to put ranch on everything"